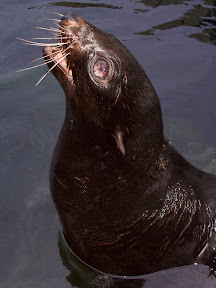 Northern fur seals have one of the densest fur coats in the world. There are up to 300,000 hairs per square inch on their bodies. 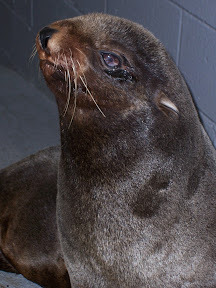 Here are two pictures of the same fur seal, Chainsaw, when she is dry and wet. They look incredibly different sometimes. When they are dry they are so soft and fuzzy, when wet they're smooth and sleek. The eyes look bigger when its wet. Do the eyes get bigger underwater maybe? oooh. I can tell how soft they are in the left pic. She looks too soft to be named chainsaw. their eyes look like crystals! are they color blind or can they see like us... do they see in the dark.